I’m Amanda, and I’m so happy you stopped by! Welcome to my little art gallery on the web where I offer art lessons, original paintings, and a little creative business help! 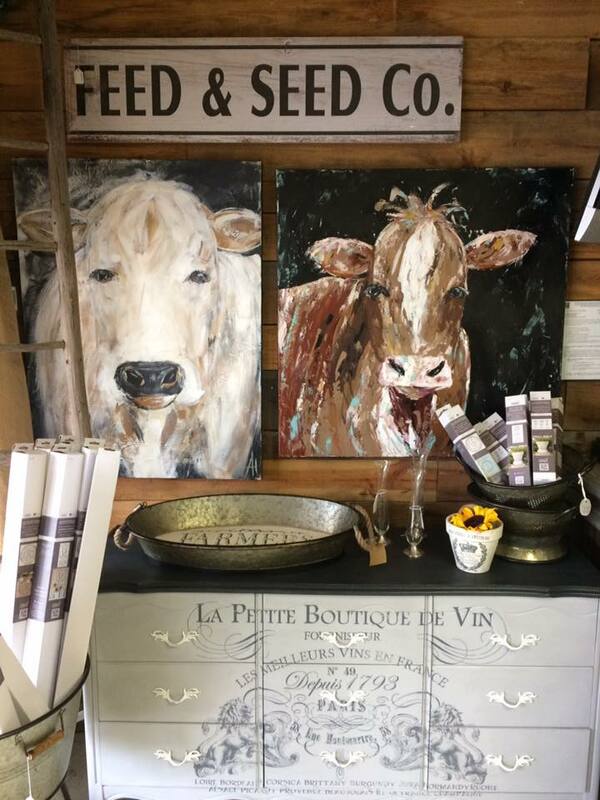 I’m a mixed media artist, and I love to use a variety of mediums on a canvas to bring an unusual twist of texture to my pieces. 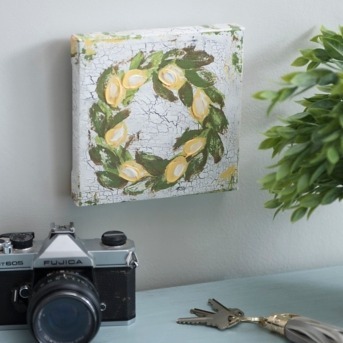 I most often paint with acrylics using a palette knife, but I might also add bits of vintage paper clippings, doilies, fabric, lace or other items to bring an unexpected pattern or structure to the surface of the canvas. I am actually an accidental artist that didn’t go looking for a creative life… it found me. When I was a content 33 year old homemaker and homeschool mom, I was trying to be frugal, so I painted something for our living room wall because I couldn’t afford to buy the art that I really wanted to hang. I shared my painting on social media and soon began taking orders! Everything really evolved from that one painting and my tiny bit of blogging experience that I had gained because of homeschooling. I started blogging about art, got on Etsy, and kept on painting. 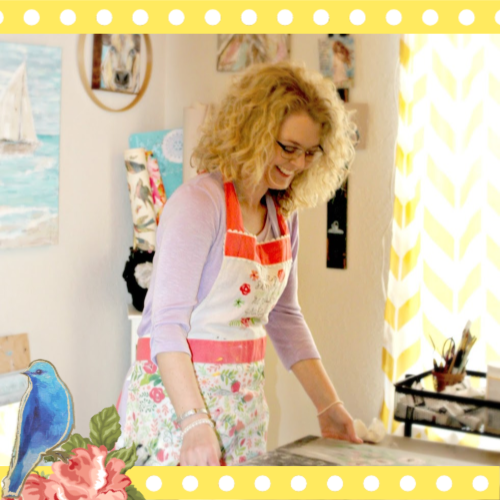 A few years later, I learned how to create my own website where I now sell my work and teach art lessons (which is where my heart is!!) . I was contacted about illustrating a children’s book and have very recently been contacted by companies about licensing some of my work. It’s really crazy how this all happened. I didn’t know I wanted this, but I don’t think I could do without it now. I am a very shy and introverted person, so I’ve had to really push myself to find the courage to keep growing and follow these new and unexpected dreams. In the process, I’ve learned so much about myself and how creativity can change your life. It’s my biggest wish to help others see their potential and know their worth. I am passionate about the reality that creativity can play a big part in your overall mental health. I truly believe that art is so much more than home decor. It is a much needed escape from the chaos of life. Art is a spark of joy in a world of unpredictable events. It is sometimes the life line that holds us when we feel like nothing in our lives is going the way we thought it would. Aside from my deeply rooted faith in God, art is a necessity to keep my sanity on this side of Heaven. I hope that you’ll discover lovely things here in my gallery that will inspire you. I want to encourage you to pick up a palette knife or a brush and dream big! Pursue your dreams, and never stop learning! Grab a cup of coffee and browse my shop. If you’d like to get to know me even more, you can follow me on Facebook or Instagram for daily peeks into what I’m painting in the studio, as well as other inspirational offerings and ideas throughout the day. You can also subscribe to my newsletter. Check out all of my Art Lessons that I offer online! Teaching and inspiring others to create is what I love to do most. I’m always brain storming ideas for new things to offer to help others, so be sure to check back often! Reproductions of my work have been featured in Kirkland’s Home stores!